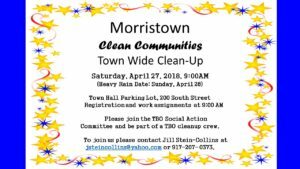 Social Action Committee Event Join Social Action on Saturday, April 27, at 9:00 AM for the annual Morristown Clean Communities Town Wide Clean-Up. On site registration and assignments will be at the Town Hall parking lot. To join, please contact Jill Stein-Collins (917-207-0373). This entry was posted in Announcements on March 20, 2019 by Kim Lefferts.